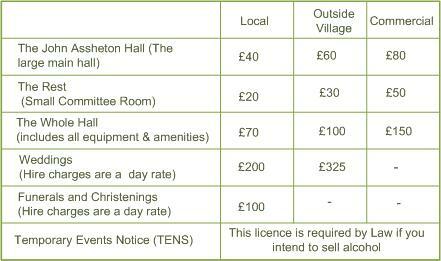 As a community facility we wish to encourage use of the village hall by local residents, our rates are therefore split into 4 main categories and sessions. In addition to hiring the Village Hall it is possible to arrange for a marquee to be erected on the playing fields to the side of the building, this is through the Playing Field Trust, and incurs a separate charge of £50.00 (plus your marquee hire costs). Should you wish to hire the hall for regular sessions or for a longer period of time please contact us to discuss how we can work together.